This course is designed for those working or wishing to work in schools with children from Early Years through to secondary age who have additional needs. The degree programme has been developed so that those wishing to work in an educational setting to support Inclusive and Special Education where children can explore a variety of contemporary topics and issues such as behaviour management, social pedagogy and inclusive education. Students will carry out research, which is relevant to their workplace. Our aim is to offer a flexible approach to learning. Our Foundation Degrees are classified as full time so that you can drawdown a student loan. College attendance is for one afternoon and evening a week (1:00pm –7:00pm). The overall hours that you attend the course are not dissimilar to what you would experience at University. We teach for 33 weeks per year whereas many university teaching years are much shorter than this e.g. Middlesex University teaches for 22 weeks per year. We use a 'blended approach to learning' where students are supported through a mixture of formal lectures, seminars, online materials and one to one tutorial support. Personal tutorials and assessment coaching sessions are held at mutually convenient times outside taught hours. In year 2, you will be expected to take on an increased responsibility for your learning and become an independent learner making increasing use of online learning as well as formal taught sessions. As previously mentioned a blended approach to learning is adopted and some sessions may be delivered online via the colleges’ virtual learning environment, Moodle. Lecture and reading materials will be placed on Moodle and each subject will have a discussion forum where you will be able to ask questions if you want to clarify an aspect of an assignment etc. All eligible applicants will be required to attend an interview. It is expected that you would have a level 3 qualification in a relevant subject. Students under the age of 21 will be expected to have a BTEC National Diploma in Childcare or similar or 2 A Levels (minimum 64 UCAS points). A requirement of the course is for students to be employed or working in a voluntary capacity in a relevant setting for a minimum of 100 hours throughout the course. All students will require a Disclosure & Barring Service (DBS) check prior to the start of the course. 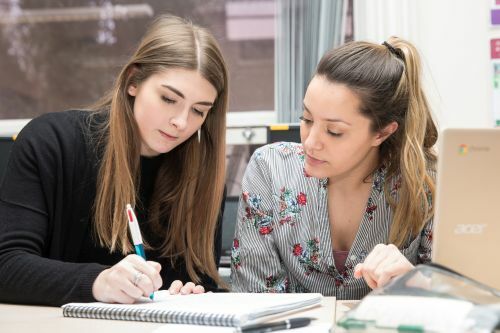 Students also have the option to 'top up' their Foundation Degree to a full Honours Degree at Peter Symonds or local universities or by choosing to progress onto the BA (Hons) in Teaching Studies, BA (Hons) in Educational Studies or BA (Hons) in Professional Practice via Middlesex University. Successful completion of the course will lead to a Foundation Degree in Inclusive and Special Education from Middlesex University. Assessment includes essays, reports, individual and group presentations, case studies, research reports and several work-based assignments. These strategies are also designed to enable the development of key transferable skills in the workplace. Tuition fees for this 2 year course are £5,300 per year for 2019 entry.